Video Encoding and Up-linking Services CCT can provide hosted video encoding services for downlinking satellite and encoding video channels in the format desired, or can directly transcode between multiple video codecs. 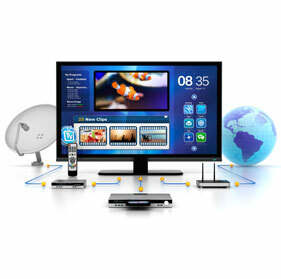 Our services allow OTT video providers to have a one stop shop solution, providing them hundreds of channels without the investment in the physical infrastructure. One each channel is encoded to the requirements of the client, the stream is seamlessly delivered over premium internet to any location in the world. CCT can provide complete solutions for Video Surveillance, ranging from simple onsite deployments to highly complex off-site storage systems. Our expertise in deployment of field infrastructure allows us execute projects in a manner that the key objectives are not neglected and the focus remains on the actual problem areas. Once the project is presented, we carefully analyze the requirements and suggest the necessary infrastructure for deployment as well as the estimated budgetary costs. Our value to the project virtually pays for itself through numerous cost saving techniques we adopt to deploy the infrastructure. In addition to traditional Video Surveillance, we also provide advanced analytics such as LPR (License Plate Recognition), Object Tracking, Object Direction, Virtual Trip Wire and Perimeter protection services.